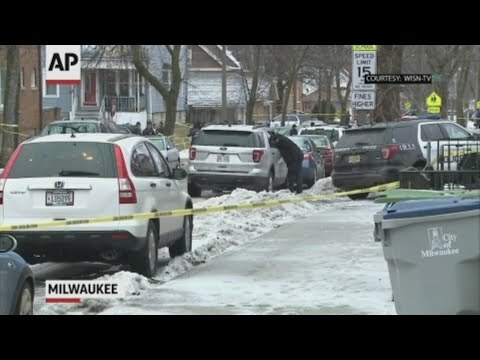 Milwaukee police say an officer shot and killed on the city’s south side was part of a unit that was conducting a search warrant on someone wanted for illegally selling firearms and drugs. Officer Matthew Rittner was a tenured member of the department’s Tactical Enforcement Unit. She said a 26-year-old Milwaukee man was arrested. It wasn’t clear Wednesday night whether he has been charged. Officer Matthew Rittner and his colleagues confronted a gunman who had tied a man and woman with electrical cords in a basement on Dec. 7, 2015. The gunman had threatened to kill the hostages when police rushed into the basement. The suspect was apprehended and the hostages weren’t harmed. A procession of police vehicles with lights flashing has accompanied the body of a fallen Milwaukee police officer from a hospital to the coroner’s office. The officer was shot and killed while trying to serve a warrant on the city’s south side Wednesday morning. The long line of squad cars left Froedtert Hospital with a hearse on Wednesday afternoon and traveled to the Milwaukee County Medical Examiner’s Office, where an autopsy is planned Thursday. A 26-year-old Milwaukee man is in custody. It’s the third time a Milwaukee officer has died in the line of duty since last June. Milwaukee officials say a 17-year police veteran was fatally shot while trying to serve a warrant, becoming the city’s third officer killed in the line of duty in eight months. Brunson says the officer was part of a Tactical Enforcement Unit serving the warrant on the city’s south side when the officers made contact with two subjects “and shots were fired.” One officer was struck and died of his injuries. Brunson hasn’t released details of the warrant being served. Mayor Tom Barrett told reporters that the officer “was doing his job” and “working to make our city safe” when he was killed. The Milwaukee Medical Examiner’s Office has confirmed the death of a Milwaukee police officer who was shot while serving a warrant on the city’s south side. The medical examiner says the officer was pronounced dead after being rushed to Froedtert Hospital following the shooting in a residential neighborhood late Wednesday morning. Details about the shooting haven’t been released. Numerous officers have gathered at the hospital. Milwaukee police planned a procession from the hospital to the medical examiner’s office downtown. The officer’s death comes six months after another Milwaukee officer, Michael Michalski, was fatally shot while trying to arrest a convicted felon wanted on drug and domestic violence offenses. There is a growing police presence at a Milwaukee hospital where an officer was taken following a shooting on the city’s south side. The Journal Sentinel reports the officer was shot while executing a search warrant and that one person is in custody. There’s no immediate word from police on the condition of the officer.